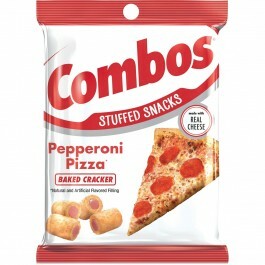 Combos Stuffed Snacks, Pepperoni Pizza Crackers volgestopt met een vulling pittige pepperoni en kaas. Met deze crackers maak je echte pizzabakker blij! Wheat Flour, Vegetable Oil (Palm Kernel, Palm Oil, Corn Oil, and/or Hydrogenated Palm Oil), Whey, Maltodextrin, Food Starch-Modified, Salt less than 1.5% - Tomato, Leavening (Baking Soda, Sodium Acid Pyrophosphate), Dextrose, Bakers and Cheddar Cheese (Milk, Cheese Cultures, Salt, Enzymes), Cream, Soy Lecithin, Spice, Yeast Extract, Citric Acid, Natural and Artificial Flavors, Onion, Caramel Color, Skim Milk, Garlic, Paprika, Beef Fat, Coloring (Red 40 Lake, Yellow 6 Lake), Malic Acid, Sugar, Disodium Inosinate, Disodium Guanylate, Propionic Acid, Hydrolyzed Soy Protein, Paprika Extract (Color).